This is another tutorial of the category ‘quick start for absolute beginners’. This time the topic is on Play 2.0, Heroku and Scala. The reason for this tutorial is that recent announcements indicate that the three topics will have a bright future together. A really nice overview of all three topics can be found in this presentation on slideshare (simply skip the Akka part. Or even better, read it as well!). As the time of writing Play 2.0 is still in beta status and according to the official homepage, APIs are likely to change a bit in the future. Nevertheless, I guess it is time to have a quick look into the new features of the framework and create a simple application. To complete the installation, you need to add the ../play20/ folder to your systems PATH environment variable. More detailed instructions on how to install Play 2.0 (either from source, or from pre-compiled binary packages) can be found in the Play 2.0 wiki. 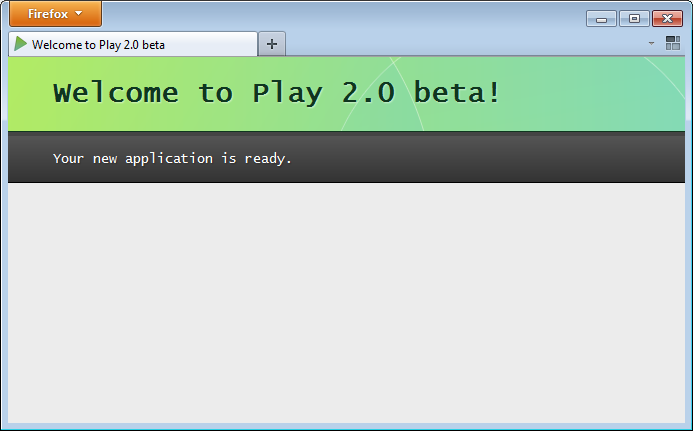 Once Play 2.0 is setup on your machine, you can create a simple applicationby typing play new myFirstApp. Provide the name of your application and as we would like to use Scala as our main development language, select the according entry. And that is it! You have just created your first Play application. Play 2.0 comes with a nifty little console, which supports many development task out of the box. The most common command for you to execute is likely to be run. Others might include, console, clean, compile and test. The commands are more or less self explanatory. Nevertheless, there is also a help goal (you may guess what this one does), and a little bit of documentation. If you don’t want to open the Play Console just to execute a single command, you can also type play [your_command]. For now, this is what you should do, type play run to start the server in development mode. After the server has been started, open a browser and go to http://localhost:9000 You should see something similar to the screenshot below. In the previous section we have successfully created a simple Play 2.0 application. The second part of this post will show you how to get this application running on Heroku. But before we go there, I would like to point you to some further resources to get familiar with Play 2.0. Most defiantly you should have a closer look on the anatomy of a Play 2.0 application. Furthermore, there are three nice sample applications, which are provided within the Play 2.0 sources and documented adequately in the wiki. Last but not least you might also want to browse through Play’s scala api manual. I promised you, that this article will show you how to get your Play application running on Heroku. So let’s see how this is done. First of all, go to heroku signup page and enter your E-Mail address. After you have received a confirmation mail and provided a password, you are successfully signed up. Next go to the quickstart guide and download the heroku toolbelt corresponding to your system and install it. After the installation is completed you can start to access heroku from the command line. Type heroku login to connect to the heroku platform servers. The first time you connect to heroku you need to provide your personal SSH key (or simply hit enter to automatically create a new one). Now that you are logged in to Heroku, you are ready to deploy your Play application. Unfortunately, your app isn’t ready for that process yet, so let’s apply some minor changes. The following section is based on the Deploying Play to Heroku tutorial, you might either read the original source or the summary given here. The next thing to do is create a local git repository for your application. 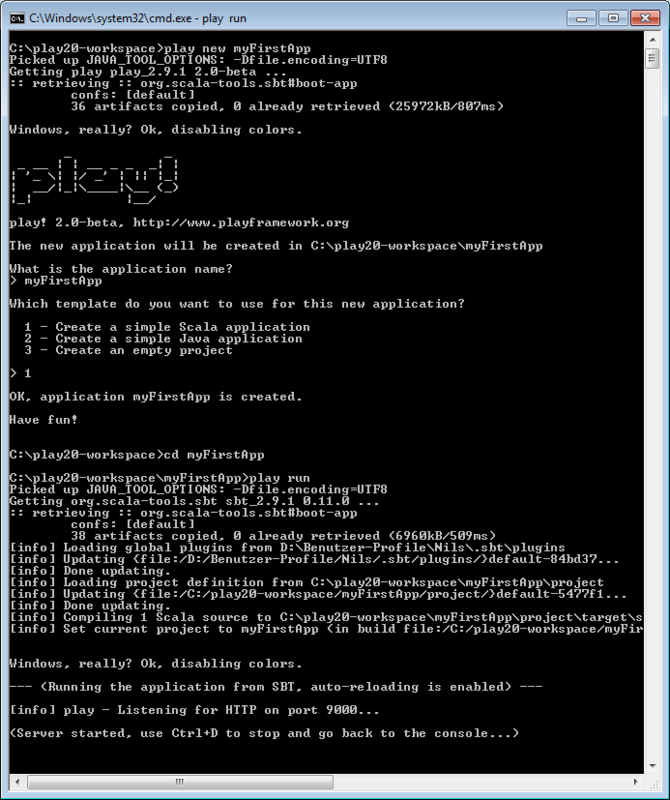 In your application root folder, just type git init to create the repo, then type git add . 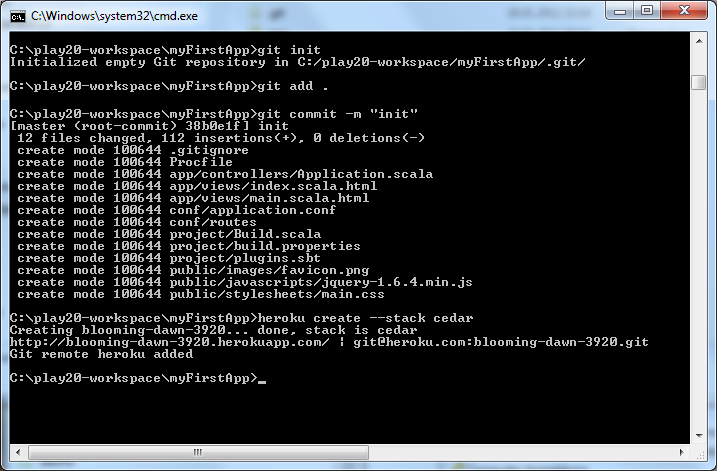 to add all files and folder and finally make a commit by typing git commit -m “init”. By now, everything you need to deploy your Play 2.0 application to Heroku should be set up. The last thing you need to do is simply push your contents from your local git repository to the heroku server. To do so, type git push heroku master, after your sources are transferred to the remote repository an automatic execution of sbt clean compile stage is triggered. If everything went well, you should see something similar to the screen shot below. You should also be able to go to your url and see your application running there. You are now ready to develop some nice features for your application. Whenever you want to deploy a new version of your app heroku, simply push your changes by executing git push heroku master again. Three more hints before I leave you alone with your app: You can tpye heroku ps to check the state of your application, call heroku logs to access your applications log files, and even start a remote REPL session by executing heroku run sbt play.